The abundance of inorganic nutrients is postulated to have a major effect on rates of encephalization; the origin of life is therefore a much more probable event than is the origin of higher intelligence. Further human encephalization may well occur. During the past two decades of my life I have been fortunate to study the skeletal remains of the great reptiles, popularly known as dinosaurs, which once abounded on the surface of our planet. Until recently, these fascinating creatures seemed to me to be utterly removed from the professional concerns of my colleagues who probe the stuff of the Universe using tools of electromagnetic radiation. One cloudy August day, a western Canadian rancher led me to the fragmented bones of a small dinosaur that died in Alberta 75 million years ago. The creature evidently walked on its hind legs and possessed three-fingered hands in which the outer finger closed against the other two like a thumb. Its eyes were large and directed toward the front of the skull, suggesting a stereoscopic field of vision. Most significantly, the cerebral hemispheres of the animal were enlarged, exceeding those of any living reptile in relative size and equaling those of some living mammals. This small dinosaur was a manifestation of the widespread tendency of animate organisms to become more intelligent through geologic time. An understanding of the factors that can affect the evolution of intelligence is of obvious importance in evaluating the Cosmos as a home for intelIigent organisms. Metazoan creatures now living on the surface of our planet, as well as the fossil record of life preserved within its crust, must reflect the effects of these factors. Unfortunately, the existing body of relevant information is both imprecise and incomplete. Because of this and because of my own limitations, the remarks that follow necessarily contain a large speculative component. It is my belief, however, that they indicate a new area of interdisciplinary research that is ripe for exploitation. We shall begin with a working biological definition of intelligence. The highest levels of intelligence attained by organisms through geologic time follow a pattern which suggests that environmental conditions affect the rate of increase of intelligence. Ten factors will be listed which may be correlated with intelligence, as deduced from the geographic and temporal distributions of intelligent organisms. These factors may in turn serve as a basis for evaluating the incidence of human or greater levels of intelligence within the Cosmos. where E is brain weight (in cgs units) and P is body weight (Jerison, 1973). It is reasonable to assume that the relative intelligence of an organism is proportional to the amount of brain tissue in excess of that necessary for body function. This is measured by the proportionality constant k in the foregoing equation. If, after removal of the body-related factor, the brain of one species of organism contains a residue of nervous tissue twice that of another species, it may be considered to have twice as much neural tissue available for sensory integration and behavioral responses. The first organism would thus be twice as encephalized and, for the purposes of the present discussion, would be considered twice as intelligent. This postulate is supported by the work of Riddell and Corl (1977), who have documented in mammals a direct relationship between the number of neurons present in the brain in excess of the body component and learning ability. There is evidence of a correlation between brain size and intelligence even within our own species (Van Valen, 1974). These concepts are reviewed in the publications of Jerison (1973, 1975a,1976) and Passingham (1975a). The intelligence sought in the search for extraterrestrial intelligence (SETI) is of a human or superior level (Morrison et al., 1977). On Earth, more than 700 million years elapsed between the appearance of multicellular metazoans and Homo sapiens. In order to discover to what extent encephalization rates may have changed during this interval, it may be useful to examine the distribution of the highest levels of encephalization through time. Previous authors have taken the average level of encephalization of lower mammals as a standard for comparison. Here the level of encephalization of lower invertebrates, such as annelid worms, is taken as unity. The comparability of encephalization indices derived from the entire range of animate organisms could be questioned. In cephalopods such as squid and octopi, relative brain size and learning ability seem to be related in the same manner as they are in backboned animals. However, it is virtually impossible to find published brain vs body weight data for cephalopods, and cerebral indices have never, to the best of my knowledge, been compared to learning ability in this group. Parenthetically, it would also be useful to know if an as yet undetected relationship exists between the size of the body component of the brain and metabolic rate in organisms. The most highly encephalized creatures on Earth have consistently been backboned animals since their appearance about 500 million years ago, thereby diminishing somewhat the uncertainties of cross-phyletic comparisons. The highest relative levels of encephalization known for various times are listed in table 1 The data are plotted on logarithmic coordinates in figure 1. 1. The increase in encephalization rates leading toward man is in accord with a trend established over 200 million years ago. 2. The increase in maximum encephalization rates was altered about 230 million years ago (in temporal proximity to the Permo-Triassic boundary crisis). 3. According to the older rates of increase, a human level of encephalization would have been attained 60 million years ago. 4. According to the younger rates, a span of 20 billion years would have been necessary to attain a human level of encephalization from that characteristic of primitive metazoans. TABLE 1. RELATIVE LEVEL OF ENCEPHALIZATION THROUGH GEOLOGIC TIME OF MOST ENCEPHALIZED ORGANISM KNOWN. 1. Insects, annelids, primitive mollusks (Crile and Quiring, 1940, p. 221). 2. Level of lower vertebrates (earliest jawed fishes: Jerison, 1973, p.136). 400 (Thomson, 1971; Van Eysinga, 1975). 3. Mammal- like reptiles (Diademodon, Jerison 1973, p. 153). 225 (Kitching, 1977; Retallack,1977; Van Eysinga, 1975). 4. Primitive mammals (Triconodon: Jerison, 1973, pp. 213-214; 1975a, p. 403). 150 (Jerison, 1973; Van Eysinga, 1975). 5. Advanced dinosaurs (Stenonychosaurus. Russell, 1969). 75 (Russell, 1969; Gill and Cobban, 1973). 6. Archaic primate (Plesiadapis. Radinsky, 1975a). 55 (Radinsky, 1975a; Berggren et al., 1978). 7. Ancien tungulate (Heptodon. Radinsky, 1978, p. 822). 8. Ancient primate (Necrolemur: Radinsky, 1975a, p. 84). 9. Living mammals (Rooneya. Radinsky, 1975a, p. 85). 35 (Radinsky, 1975b; Berggren et al., 1978). 10. Primitive anthropoid apes (Aegyptopithecus. cf. Radinsky, 1975a, p. 85). 11. Anthropoid apes (Dryopithecus. Radinsky, 1974, p. 21). 12. Primitive hominid (Australo pithecus: Jerison,1975b, p. 45). 13. Primitive Homo (H. habilis. Jerison, 1975 b, fig.1). 2.3 (Johansen and White, 1979). 1.5 (Johansen and White, 1979). 15. Homo sapiens (Jerison, 1975b, fig.1). 0.25 (Johansen and White, 1979). Figure 1. Maximum encephalization levels through geologic time (see table 7). The dotted line is drawn through the highest encephalization levels attained by modern shark (cf Crile and Quiring, 1940, Bauchot et al., 1976) and of primitive jawed fishes at the time of their appearance. The foregoing trends are difficult to explain. They parallel in an interesting manner organic diversity trends plotted for the same general span of time (Valentine, 1972, fig. 10-3). For the purpose of stimulating discussion, it is suggested that the establishment of terrestrial ecosystems during the latter part of the earlier period may have impaired the flow of terrestrial nutrients to the oceans, producing the observed pattern of encephalization trends as well as a net lowering of rates of maximum increase of encephalization on the planet. Mean annual temperatures on the surface of Earth generally increase from the poles toward the equator. This is accompanied by an increase in the abundance of highly encephalized fishes (Bauchot et al., 1977) and reptiles (Hopson, 1977) as well as primates, among mammals. Learning in poikilothermic lizards becomes more rapid as body temperatures approach the range 35° to 40°C (Brattstrom, 1978, p. 174). However, brain malfunction and death occur in both cold- and warm-blooded vertebrates above 40 C (Wheeler, 1978), suggesting a general thermal optimum in the range 25° - 35°C. Encephalization is an attribute that does not evolve rapidly In the Hominidae, the most rapidly encephalizing phylum known, the average level of encephalization has doubled during the last 2 million years (Jerison, 1975b; Johanson and White, 1979). In mammals, the average level has only doubled during the last 45 million years (Radinsky, 1978). Encephalization,  although apparent in many other groups of organisms, generally proceeds at much slower rates (Jerison, 1973). It is axiomatic that complicated responses tend to be required of organisms inhabiting complex environments. The rates at which organic processes occur should also affect the rapidity and precision of behavioral responses. Greater plant diversity increases competitive interactions, enhancing selection for rapid growth strategies (Regal, 1977) and thereby plant productivity. Thus biogenic environmental diversity should produce high rates of encephalization (Regal, 1978). It has been suggested that the need to locate packets of energy-rich foods that are erratically distributed in time and space has produced higher levels of encephalization in fruit-eating than in insect-eating bats (Regal, 1978; Eisenberg and Wilson, 1978). Factors that depress diversity, such as environmental instability, aridity, unavailability of essential elements, and ionizing radiation (Whittaker and Woodwell, 1971; Valentine, 1972; Parker, 1976; Connell, 1978; May, 1978), may also depress rates of encephalization. As a possible example of the latter phenomenon, marine organisms have generally not achieved levels of encephalization comparable to those of their more highly encephalized terrestrial counterparts. The most highly encephalized marine organisms are birds and mammals that reinvaded the seas from the land, indicating that a niche for intelligent creatures was present there but underexploited. Neither are marine environments generally as Productive as terrestrial environments (Rodin et al., 1975), perhaps partly as a result of the capture of nutrients derived from subaerial erosion by terrestrial ecosystems (cf. Tappan, 1968, pp. 195-197). Could the lower level of encephalization of marine organisms be in part a consequence of long term (>100 million years) suboptimal nutrient availability? South America and Australia were isolated from other large land masses during much of the past 60 million years. Indigenous land-dwelling mammals showed little increase in encephalization (Jerison, 1973, pp. 320-339). It has been postulated (Andrews in Jerison, 1975a, p. 405) that this was due to very low levels of biotic interchange with vast, intermittently connected lane areas of great environmental diversity. The primitive nature of the terrestrial biota of New Zealand and New Caledonia (Raven and Axelrod, 1972), isolated on small land masses for 80 million years, may be cited in support of this suggestion. A relatively well-studied, direct relationship exists between area and biotic diversity (May, 1978). A brief but acute environmental crisis precipitated the sudden extinction of the dinosaurs about 65 million years ago, together with more than half the species of organisms then in existence (Russell, 1979). Consequently, the mean level of encephalization in terrestrial vertebrates may have effectively remained stable for 10 million years (table 1) until the basic diversification of replacing mammalian groups was completed. The effects of previous mass extinctions are not clear, although temporary reductions in biogenic environmental diversity would presumably have had a negative effect on encephalization rates. Organisms that defend themselves by means of static defense mechanisms, such as armor, spines, or poison, tend to be poorly encephalized. The coincidence has been noted in bony fishes (Bauchot et al., 1977) and in dinosaurs (Hopson, 1977). Sessile creatures such as corals and oysters possess relatively simple nervous systems (Bullock and Horridge, 1965), and most vascular plants are devoid of organs analogous to nerves in function. Active, foraging creatures tend to occupy relatively higher positions in the food chain and to be relatively more encephalized. This has been noted in invertebrates (Bullock and Horridge, 1965), sharks (Okada et al., 1969; Bauchot et al., 1976), lizards (Regal, 1978), and dinosaurs (Hopson, 1977). Avian and mammalian herbivores are approximately as encephalized as carnivores within their respective classes (cf. data in Crile and Quiring, 1940; Radinsky, 1978), possibly because of their active, evasive, or aggressive strategies of defense. In man, the brain is an expensive organ to maintain, requiring 20% of the energy consumed by the body when resting (Sokoloff, 1976). This fraction approaches the overall metabolic needs of active reptiles of comparable body size (fig. 4 in Farlow, 1976). A large brain is therefore incompatible with a reptilian metabolism. The highest levels of encephalization Occur in birds and mammals, where an enlarged brain is supported by high metabolic rates. These organisms have colonized the cooling, diminishingly productive  polar regions in the same manner as they invaded the sea, with no apparent effect on their levels of encephalization (data in Portmann, 1947a; Crile and Quiring, 1940). Some highly encephalized predatory sharks also have relatively high metabolic rates (Stevens and Neill, 1978). The physical milieu forms an element of the environmental complexity of an organism's habitat, as well as influencing the speed at which an animate creature moves. This is exemplified by a supplementary neurophysiological capacity in flying insects and birds (Jerison, 1973, pp. 156-161). Pelagic, free-swimming sharks (Okada et al., 1969) and bony fishes (data in Tuge et al., 1968; Bauchot et al., 1977) are more highly encephalized than their counterparts inhabiting essentially two-dimensional environments on the sea floor. However, pelagic cephalopods are not more highly encephalized than benthonic cephalopods (data in Wirz, 1959), possibly because their habitat is more complicated than the less dimensionally restricted environment preferred by their nektonic relatives. In relatively highly encephalized organisms, a large proportion of the brain contains information that is derived from experience rather than inherited. The young of highly encephalized birds often require a correspondingly greater investment of parental care (Portmann,1947b). Our own species may be cited as an example of this phenomenon. What planetary conditions would most effectively promote the development of humanoid intelligence from primitive multicellular metazoans? Earth has probably not been an ideal nursery for intelligent organisms. However, the general environmental framework of the planet should resemble that of Earth during the past half-billion years. Inorganic nutrients should be in sufficient abundance to sustain high encephalization rates in the oceans after the establishment of terrestrial ecosystems. The thermal regime should be such that the largest possible area of the planetary surface enjoys mean annual temperatures of about 30°C. Rotational rates must be neither so rapid that steep latitudinal thermal gradients are produced (Hunt, 1979), nor  so slow that diurnal thermal fluctuations become extreme. Epicontinental seas should be shallow and extensive to facilitate the growth of biogenically and dimensionally complex environments. Seasonality should be minimal, and the rotational poles nearly vertical to the planetary orbit. Planetary size should be the maximum consistent with long-term environmental stability. Given these conditions, it would not be surprising if octopoid creatures (cf Bullock and Horridge, 1965, p. 1434), with humanoid levels of encephalization and the capacity to manipulate objects, were derived from primitive multicellular metazoans in about 5OO million years. These creatures could be expected to have relatively high metabolic rates, low reproductive rates, and long life spans, much of which would be invested in caring for their young. The oceans, deserts, and polar regions of Earth may not have produced organisms of a high level of encephalization. Rather, they have been invaded by highly encephalized creatures that evolved in biologically more productive terrestrial environments. Thus the process of encephalization, and accompanying physiologic homeostasis, may tend to free organisms from constraints that limit the distributions of their less encephalized predecessors. In this general context, it might be useful to consider briefly the future of our own species. A great range of possible social behaviors and a rapidly growing technological capacity have generated an undercurrent of pessimism concerning the probability of long-term human survival. Whether these behavioral contradictions are typical only of man or are endemic to any organism that attains a humanoid level of intelligence is a moot point. It is conceivable, however, that behavioral selective pressures will operate in a manner such that imminent human extermination will be avoided. A trend toward improvement of brain function, manifested in both brain volume and organization, would continue, although at times organization may change more rapidly than size, and conversely. 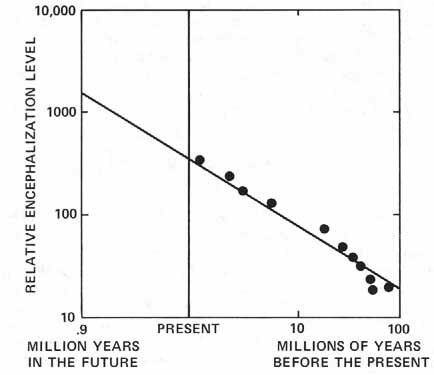 Assuming that the curve in figure 1 usefully describes encephalization increase over such a short interval of time, it can be crudely projected to a point 900,000 years in the future (fig. 2) by adding this figure to each of the age records tabulated in table 1. At such a time, our brain would exceed its present volume by a factor of about 3, and life spans would nearly double (Sacher, 1978). The upper part of the vertebral column would be rather more powerfully constructed to support the additional weight of the head. The young would be born after a shorter term and in a more immature state neurologically, so that the larger head could more easily pass through the somewhat wider pelvic canal (cf. Sacher and Staffeldt, 1974; Passingham, 1975b). The enlarged brain could consume nearly 1/3 the total adult daily energy requirements (cf. Tuttle and Schottelius, 1965, pp. 340, 342, 510), implying that present metabolic rates would then be taxed to maintain bodily functions. Nevertheless, a brain growth of this magnitude does not seem physiologically impossible. Figure 2. Maximum encephalization level projected 900,000 years into the future. The projection intersects the ordinate at a relative encephalization level of about 1,100, representing an increase of three in brain weight over the level typical of Homo sapiens but no increase in body weight. For further explanation see text. When human brain size merely doubled during the last 2 million years, man acquired language, libraries, and a technology that has enabled him to begin to explore the planets. The projected increase in brain size could not unreasonably be postulated to produce an analogous expansion in human mental abilities. Compared to the nearly 4-billion-year record of life on Earth J the next 900,000 years is not a large span of time. Until recently, the terrestrial biosphere was assumed to be "closed" in the sense that it would permanently be confined to the surface of Earth. There it would eventually become simpler and vanish as the Sun entered its red giant phase. If man is already able to establish ecologically self-sustaining colonies in space, as O'Neill (1976) has suggested, then the biosphere of Earth will become "open" in the sense that its ultimate fate need not be linked to that of the Sun It is difficult to imagine why creatures of human or superior levels of intelligence would not rapidly colonize stellar regions close to the planetary systems within which they originated. The SETI program need not be limited to stars that are as stable or as old as the Sun. The physiological and astrophysical implications of the generalizations tentatively proposed here far exceed my area of competence (cf. Carr and Rees, 1979). In a mysterious manner, metazoan encephalization rates even on Earth have during certain periods been such that if sustained levels of intelligence could only appear on a time scale comparable to the age of the Universe. It would seem that the origin of life is intrinsically a much more probable event than the origin of higher intelligence. The memory of assistance generously given by others is an enduring source of pleasure. I am, accordingly, fortunate to express my gratitude to my colleagues at the National Museum of Natural Sciences (Canada) for their help in this project. Drs. Donald E. McAllister and Henri Ouellet provided valuable material on relative brain size in fishes and birds, respectively. The manuscript has been much improved through the constructive comments of Dr. Pierre Beland. Within the larger academic community of Ottawa, Dr Anthony Devine, M.D., supplied interesting information relating to the mete boric requirements of the human brain, as did Dr. Nancy M. McAllister with regard to those of lower vertebrates. I have also benefited from the perspectives of Drs. E. O. Dodson of the University of Ottawa and R. E. Morlan of the National Museum of Man. Drs. H. J. Jerison, of the University of California at Los Angeles, and L. B. Radinsky, of the University of Chicago, reviewed the manuscript in light of their extensive paleoneurological experience. I am very grateful to them. Finally, and particularly, I am grateful to my wife, Dr. Janice Alberti Russell, for many hours shared discussing the human ramifications of the biology of intelligence. - Bauchot, R.; Platel, R.; and Ridet, J.-M.: Brain Weight, Body Weight Relationships in Selachii. Copeia, 1976, pp. 305-310. - Berggren, W. A.; McKenna, M. C.; Hardenbol, J.; and Obradovich, J. D: Revised Paleogene Polarity Time Scale. J. Geol., vol. 86, Jan. 1978, pp. 67-81. - Brattstrom, e,. H.: Learning Studies in Lizards. In: Behavior and Neurology of Lizards, N. Greenberg and P. D. MacLean, eds., U.S. National Institute of Mental Health (DHEW Publication no. (ADM)77-491. ), 1978, pp. 173-181. - Bullock, T. H.; and Horridge, G. A.: Structure and Function in the Nervous Systems of Invertebrates. W. H. Freeman, San Francisco, 1965. - Carr, B. J.; and Rees, M. J.: The Anthropic Principle and the Structure of the Physical World. Nature, vol. 278, Apr.12,1979, pp. 605-612. - Crile, G.; and Quiring, D. P.: A Record of the Body Weight and Certain Organ and Gland Weights of 3690 Animals. Ohio Journal of Science, vol. 40,1940, pp. 219-259. - Connell, Joseph H.: Diversity in Tropical Rain Forests and Coral Reefs. Science,vol.199, March 24,1978, pp.1302-1310. - Eisenberg, J. F.; and Wilson, D. E.: Relative Brain Size and Feeding Strategies in the Chiroptera. Evolution, vol. 32,1978, pp. 740-751. - Farlow, J. O.: Consideration of Trophic Dynamics of a Late Cretaceous Large-Dinosaur Community (Oldman Formation). Ecology, vol. 57 1976, pp. 841-857. - Gill, J. R.; and Cobban, W. A.: Stratigraphy and Geologic History of the Montana Group and Equivalent Rocks, Montana, Wyoming, and North and South Dakota. United States Geological Survey Profession Paper 776,1973. - Hopson, J. A.: Relative Brain Size and Behavior in Archosaurian Reptiles. Ann. Rev. Ecology Systematics, vol. 8,1977, pp. 429-448. - Hunt, B. G.: The Effect of Past Variations of the Earth's Rotation Rate on Climate. Nature, vol. 281, Sept. 20,1979, pp.188-191. - Jerison, H. J.: Evolution of the Brain and Intelligence. Academic Press, N.Y ., 1973. - Jerison, H. J.: Evolution of the Brain and Intelligence. Current Anthropol., vol. 16,1975a, pp. 403-426. - Jerison, H. J. Paleoneurology and the Evolution of Mind. Sci. Amer., vol.234, Jan. 1976, pp. 90-101. - Johanson, D. C.; and White, T. D.: A Systematic Assessment of Early African Hominids. Science, vol. 203, Jan. 26,1979, pp. 321 -330. - Kitching, J. W.: The Distribution of the Karoo Vertebrate Fauna. Bernard Price Institute of Paleontological Research Memoir 1, 1977. - May, R M. The Evolution of Ecological Systems. Sci. Amer., vol. 239 Sept. 1978, pp 160-175. - Morrison, P.; Billingham, J; and Wolfe, J.: The Search for Extraterrestrial Intelligence. NASA SP-419, 1977. - O'Neill, G.: The High Frontier: Human Colonies in Space. Bantam Books. Des Plaines, IL, 1976. - Parker, R. H.: Classification of Communities Based on Geomorphology and Energy Levels in the Ecosystem. In: Structure and Classification of Paleocommunities, R. W. Scott and R. R. West, eds., Dowden, Hutchinson and Ross, Stroudsburg, PA,1976, pp. 67-86. - Passingham, R. E.: The Brain and Intelligence. Brain Behavior and Evolution, vol.11, 1975a, pp. 1-15. - Portmann, A. Etudes sur la Cerebralisation chez les oiseaux.II. Les Indices Intra-cerebraux. Alauda, vol. 15, 1947a, pp. 1-15. - Portmann, A.: Etudes sur la Cerebralisation chez les oiseaux III. Cerebration et mode ontogenetique. Alauda, vol. 15,1947b, pp. 161 -171. - Radinsky, L.: The Fossil Evidence of Anthropoid Brain Evolution. Am. J Phys. Anthropol., vol. 41,1974, pp.15-27. - Radinsky L.: Early Primate Brains: Facts and Fiction. Am. J. Phys. Anthropol., vol. 42, no. 2,1975a, p. 324. - Radinsky, L.: Primate Brain Evolution. American Scientist, vol. 63, 1975b pp. 656-663. - Radinsky, L.: Evolution of Brain Size in Carnivores and Ungulates. American Naturalist, vol.112,1978, pp. 815-831. - Raven, P. H.; and Axelrod, D. I.: Plate Tectonics and Australasian Paleobiogeography. Science, vol. 176, June 30,1972, pp.1379-1386. - Regal, P. J.: Behavioral Differences Between Reptiles and Mammals: An Analysis of Activity and Mental Capabilities. In: Behavior and Neurology of Lizards; An Interdisciplinary Colloquium, Neil Greenberg and Paul D. MacLean, eds., U.S. Department of Health, Education and Welfare, Rockville, MD, 1978, pp.183-202. - Retallack, G. J.: Reconstructing Triassic Vegetation of Eastern Australasia A New Approach for the Biostratigraphy of Gondwanaland. Alcheringa, vol.1,1977, pp. 247-278. - Riddell, W. I.; and Corl, K. G.: Comparative Investigation of the Relationship Between Cerebral Indices and Learning Abilities. Brain, Behavior and Evolution, vol.14,1977, pp. 385-398. - Rodin, L. E.; Bazilevich, N. l.; and Rozov, N. M.: Productivity of the World 's Main Ecosystems. In: Productivity of the World Ecosystems; D. E. Reichle, J. F. Franklin, and N. N. Rozov, eds., U.S. National Academy of Sciences, 1975, pp.13-26. - Runnegar, B.: Evidence for Precambrian Eukaryota. Alcheringa, vol. 1977, pp. 311-314. - Russell, D. A.: A New Specimen of Stenonichosaurus from the Oldman Formation (Cretaceous) of Alberta. Canadian J. Earth Sci., vol. 6, 1969, pp. 595-612. - Russell, D. A.: The Enigma of the Extinction of the Dinosaurs. Ann. Rev Earth Planetary Sci., vol. 7,1979, pp.163-182. - Sacher, G. A.: Longevity and Aging in Vertebrate Evolution. Bioscience vol. 28, Aug.1978, pp. 497-501. - Sacher, G. A.; and Staffeldt, E. F.: Relation of Gestation Time to Brain Weight for Placental Mammals: Implications for the Theory of Vertebrate Growth. American Naturalist, vol. 108,1974, pp. 593-615. - Sokoloff, L.: Circulation and Energy Metabolism of the Brain. In: Basic Neurochemistry, 2nd edition, G. J. Siegel, R. W. Alberts, R. Katzman, and B. W. Arganoff, eds., Little, Brown, and Co., Boston, 1976, pp. 388-413. - Stevens, E.; and Neill, W. H.: Body Temperature Relations of Tunas, Especially Skipjack. In: Fish Physiology, W. S. Hoar and D. J. Randall, eds., Academic Press, N.Y., 1978, pp. 315-359. - Tappan, H.: Primary Production, Isotopes, Extinctions and the Atmosphere. Palaeogeography, Palaeoclimatology, Palaeoecology, vol. 4, 1968, pp.187-210. - Thomson, K. S.: The Adaptation and Evolution of Early Fishes. Quarterly Rev. B dol., vol. 46, June 1971, pp. 139-166. - Tobias, P. V.: Implications of the New Age Estimates of the Early South African Hominids. Nature, vol. 246, Nov. 9,1973, pp. 79-83. - Tuge, H.; Uchihashi, K.; and Shimamura, H.: An Atlas of the Brains of the Fishes of Japan. Tsukiji Shokan Publishing Co., Tokyo, 1968. - Tuttle, W. W.; and Schottelius, B. A.: Textbook of Physiology, 15th edition, C. V. Mosby Co., St. Louis, Mo., 1965. - Valentine, J. W.: Conceptual Models of Ecosystem Evolution. In: Models in Paleobiology, T. J. M. Schopf, ed., W. H. Freeman, San Franscisco,1972, pp.192-215. - Van Eysinga, F. W. B.: Geological Time Table. Elsevier, Amsterdam, 1975. - Van Valen, L: Brain Size and Intelligence in Man. Am. J. Phys. Anthropol., vol. 40,1974, pp. 417-423. - Wheeler, P. E.: Elaborate CNS Cooling Structures in Large Dinosaurs. Nature, vol. 275, Oct. 5,1978, pp. 441 -443. - Whittaker, R. H.; and Woodwell, G. M.: Evolution of Natural Communities. Oregon State University, Biological Colloquium, vol. 31, 1971, pp.137-159. - Wirz, K.: Etude biometrique du systeme nerveux des cephalopodes. Bulletin Biologique France et Belgique, vol. 93,1959, pp. 78-117.